The first weekend in May annually features some of the greatest spectacles in sports. Garish hats, mint juleps and racehorses conquer Louisville, Ky., for the Derby. Early spring is a grand time for a big fight, too, be it in UFC or boxing. In basketball, meanwhile, the NBA’s playoffs roll into their second round as the true championship contenders separate themselves from the squads that are happy to be in the postseason. The same can be said of the NHL. And this year, video game players from around the country will congregate in Austin, Texas, for 2016’s Dreamhack — a computer and technology event that has grown into one of the largest eSports events. More than $300,000 is on the line in games such as Heroes of the Storm, Hearthstone, Counter-strike: Global Offensive, Super Smash Bros.: Melee, and more. Like it or not, gaming has matured from a nerdy, niche hobby to big business — and one of the fastest-growing sports in the world. How did we get here? The technology for a home-video game console arrived around the 1960s and culminated in 1972 with the Magnavox Odyssey. Almost immediately, home gaming became an avenue for competition, thanks largely to the popularity of the Pong arcade game and its knock-offs that were released for the home. The idea of competing against others from around the globe in video games came about fairly early as well. After all, once you’d vanquished everyone on your block, who was left to challenge you? As gaming became a more popular outlet for competition between friends, video games emerged from homes back into arcades. Most famously, the original arcade version of Donkey Kong launched a nationwide competition to see who could set the highest score on their local machine. In the days before the Internet, people competed through word of mouth and proof of their scores that they posted in trade magazines. As far back as 1980, video game publisher Atari hosted "The Space Invaders Tournament," which drew 10,000 players. Still, as popular as video games might have been, the competitions were kept out of the public spotlight. Tournaments would continue to spring up here and there, often based on the fighting games such as Street Fighter and Mortal Kombat that came out in the early 1990s. In time, first-person shooters such as Goldeneye would take advantage of more powerful computers and pave the way for games like Halo and the new Overwatch. Yet for all the competition brewing, there was no actual way to link players with each other on a day-to-day basis. Like in every other industry, the internet changed everything. During the dial-up modem days, players were finally able to compare high scores and share strategies with relative ease. Message boards became scoreboards, and a community started to form that would shape video games into eSports. In a foreshadowing of how the industry would grow and evolve, however, it wasn’t the video-game publishers themselves who pushed eSports forward. The players would decide what games would rise to the level of sport and which would fall to the wayside. Blizzard Entertainment set the stage with two of its most successful games, Starcraft (released in 1998) and Warcraft III (released in 2002). At their highest level, the games — particularly Starcraft — require the player to make hundreds, if not thousands, of decisions and actions every minute. As high-speed internet took off at the turn of the millennium, Starcraft, with its highly intricate play, multiple winning strategies and huge gap between novices and the most-skilled players exploded in popularity in South Korea. Within 18 months of the game’s launch, matches were broadcast on Korean television as part of a professional sports league. At the same time, video- game consoles were being released with internet connections that allowed players to challenge their friends across the country — and the world. Video games started to tout their best players, offering in-game perks to the winners and setting up ranking "ladders" that allowed players to vie for alpha status in their community. Real-time strategy games come with a steep learning curve, however. Video games needed to find a happy medium between a complicated game that intrigues its audience and accessibility to new players. A player-created modification of Warcraft III, Defense of the Ancients, hit that sweet spot and gave rise to a genre of games, called MOBAs. In the genre, you control one character, a hero with special abilities and a unique look. You join forces with four other teammates to fight a team of five opposing heroes. Each hero has three unique "spells," plus a super-powerful ultimate ability. Today, that type of game rules the eSports landscape, with first-person shooters and fighting games making up much of the rest of the scene. DOTA was spun off and emulated by competitors who fixed some of its issues while adding depth and visual flair to the games. Moreover, these new MOBAs were free-to-play, removing every barrier of entry short of having a computer powerful enough to play. If you’ve tuned in for League of Legends, DOTA 2 or Heroes of the Storm, you’re familiar with MOBAs. The player-base expanded. The technology caught up. But without an organization, video games were doomed to be nothing more than a niche corner of the world. So in 2002, Major League Gaming formed to promote video games as sport. MLG initially focused mostly on Starcraft and first-person shooters, most notably Halo 2, and began hosting tournaments both in physical locations and online. From there, the sport needed to be exposed to the world. As the popularity of those events increased, the notion of broadcasting video games on television in North America took hold. The first North American eSports broadcasts took place almost exactly 10 years ago. The USA Network partnered with MLG to broadcast Halo 2 in 2006 and 2007. Unfortunately, first-person shooter games aren’t the greatest spectator experience on TV, so the experiment failed. A non-traditional sport needed a new medium for its broadcasts. Television wouldn’t suffice. Video games needed Twitch. The online streaming service, which launched in 2011, allows anyone to become their own broadcast network, and popular video game players immediately started streaming themselves to the internet at large. Unlike TV, however, Twitch offers an avenue for engagement between the broadcaster and the audience. On the side of the screen is a chat window, where fans can leave comments, argue among each other, or just heckle everyone if they’re so inclined. Being on Twitch became an activity in and of itself, driving more engagement. That engagement became a self-fulfilling prophecy, with Amazon eventually purchasing Twitch in 2014. As Twitch went mainstream, so too did its most popular broadcast property — video games. And in a bit of serendipity, today’s most popular eSport video game, League of Legends, started to truly catch on with video game fans just as Twitch was taking off. The success of DOTA as a WCIII modification had inspired its most ardent fans to recreate the game in a more professional setting. They believed that rather than just an addendum to a pre-existing game, MOBAs deserved to have their own genre and be developed as their own games. In 2009, LoL launched in a beta form, allowing players to play the game, test it and give their feedback before the game’s official release. The game was an immediate hit, especially in the eSports world. If eSports is analogous to poker, with its countless different games all played at various stakes both large and small, League of Legends became the Texas Hold ‘Em of the video game world. By 2011, LoL had its own world championship, and in 2013, the LoL finals in Los Angeles sold out Staples Center within an hour of tickets going on sale. By 2015, one of LoL‘s major competitors, DOTA 2, would host a grand final with $5.5 million on the line for the winning team. In the most-watched sports, those numbers simply keep growing. You can yell and scream that video games aren’t sports as much as you’d like, but it’s probably wiser to get on board. There is no sign of things slowing down any time soon. 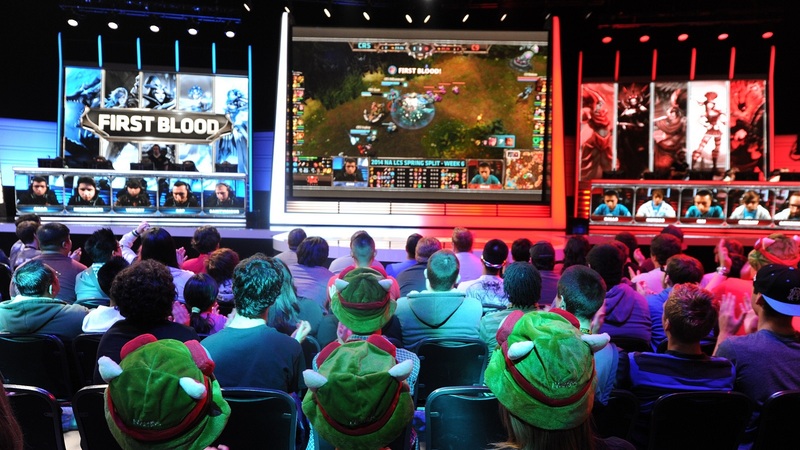 Some estimates project eSports will be a billion-dollar industry by 2020. Those numbers may be optimistic; in reality, no one truly knows what’s on the horizon for eSports. Then again, who could have imagined video games would ever have reached this point in the first place?